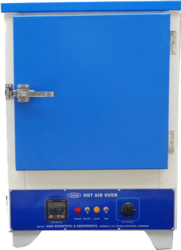 We fabricate a comprehensive range of laboratory hot air oven that are used extensively in various laboratory processes. These ovens serve in the application areas such as cleaning rooms, forced convection, horizontal airflow, inert atmosphere, natural convection and pass through. They are intended for high forced volume thermal convection applications. We are offering our customers a huge range of Hot Air Oven Memmert Types, which are suitable for temperature up to 250°C for chemicals, glassware in laboratories, research institutions, industries, hospitals & R & D centers. Our hot air overs are suits to various applications like heating, drying, sterilizing & baking. Triple walled in construction inner chamber made of Mild Steel / St. Steel and exterior made of G.I. sheets Powder coated. The gap between the two walls filled with glasswool insulation. Heating elements fitted on the two sides of the oven .A forced Air Circulating system with fan for better uniformity of temperature. We are involved in offering a wide range of Hot Air Ovens to our most valued clients. Our range of Hot Air Ovens is widely appreciated by our clients which are situated all round the nation. We offer our range of Hot Air Ovens at most affordable prices. Double Walled Construction inner chamber made of mild Steel/St. Steel/ and exterior G.I sheets Powder coated. The gap between the two walls filled with glasswool insulation. Temperature controlled by thermostat. Supplied with G.I. wire mesh shelves.